About R. Y. Langham, Ph.D.
Cholesterol is a waxy, fatty substance that is found in almost every part of your body. Some cholesterol is needed to keep your body functioning at an optimal level, but excess amounts of cholesterol can stick to your arterial wall linings and prevent blood, oxygen and nutrients from reaching your organs and tissues. High cholesterol levels can increase your risk of heart disease, heart attacks and strokes. A variety of vitamins can help prevent fatty deposits from sticking to your artery walls and help decrease high cholesterol levels. Vitamin B-3, also known as niacin, is a water-soluble vitamin that repairs damaged blood vessels and removes fatty deposits from your artery walls, according to Jordan Rubin, author of “The Great Physician’s Rx for High Cholesterol.” Rubin also notes that vitamin B3 increases your levels of high-density lipoprotein, or HDL, also known as "good" cholesterol, while decreasing your levels of low-density lipoprotein, or LDL, also known as "bad" cholesterol. In addition, Rubin reports that vitamin B3 reduces high cholesterol levels by decreasing the amount of homocyteines in your body. Homocysteines are naturally occurring amino acids that can damage your artery walls and increase your risk of heart attacks and strokes. Foods rich in vitamin B3 include whole grains, beef, turkey, fish, poultry, almonds, peanuts, mangoes, peaches and baked potatoes. 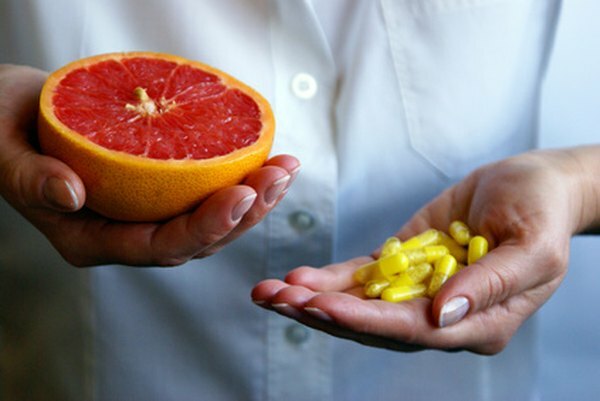 According to Graham Jackson, author of “Heart Health: The 'At Your Fingertips' Guide,” vitamin B9, also known as folic acid, is a water-soluble vitamin that aids in the production of red blood cells, reduces homocysteines in your body, supports cardiovascular health and prevents fatty deposits from accumulating on your artery walls. In addition, notes Jackson, vitamin B9 helps regulate your cholesterol levels, repairs damaged blood vessels and lowers your risk of heart disease, strokes and heart attacks. Foods rich in vitamin B9 include dates, poultry, cheese, oranges, milk, spinach, whole grains, whole wheat and beans. Vitamin C is a water-soluble antioxidant that strengthens your immune system and protects your body from infections, viruses, toxins and diseases that can cause high cholesterol, according to Karen Kingham, author of “Eat Well, Live Well with High Cholesterol: Low-Cholesterol Recipes and Tips.” Kingham reports that vitamin C also regulates your blood pressure, accelerates the healing process, and transports oxygen, nutrients and blood to your organs and tissues. In addition, notes Kingham, vitamin C lowers your risk of heart attacks, strokes and atherosclerosis, a vascular disease that occurs when cholesterol accumulates on your artery walls, causing them to thicken and restrict blood flow to your heart and the rest of your body. Foods rich in vitamin C include oranges, grapefruits, pineapples, kiwi, tomatoes, kale, mustard greens, spinach, cranberries, blueberries, watermelon and strawberries. Vitamin E is a fat-soluble antioxidant that improves immune system function and protects your body against harmful free radicals that that can increase cholesterol levels, according to the authors of “Heart Attack! Advice for Patients by Patients.” They also report that vitamin E repairs damaged blood vessels, promotes cardiovascular health, aids in the healing process, prevents cellular damage, reduces high cholesterol levels and lowers your risk of heart attacks, heart disease and strokes. Foods rich in vitamin E include sunflower seeds, liver, hazelnuts, pine nuts, sweet potatoes, pumpkin seeds, eggs, margarine, carrots, mayonnaise, broccoli, asparagus and peppers.